Avery 2″ hexabumper 6-packs — Six each of one color. Pick white, orange or flasher (black and white). The hexabumpers’ valveless design won’t take in water, and the raised VGrips encourage better holding with less sliding in wet mouths. HexaBumpers’ flat sides promote secure holding as well. Very firm. 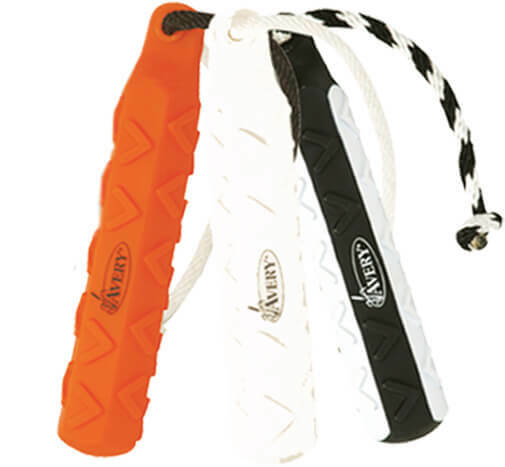 Available in white, orange and “flasher.” The flasher concept — alternating black and white sides — gives a hi-viz strobe effect in the air to catch your dog’s eye. The Ugly Dog grab-gum-and-chew bumper testing team have certified the Avery hexabumpers as the easiest to hold, best to mark and most difficult to demolish.